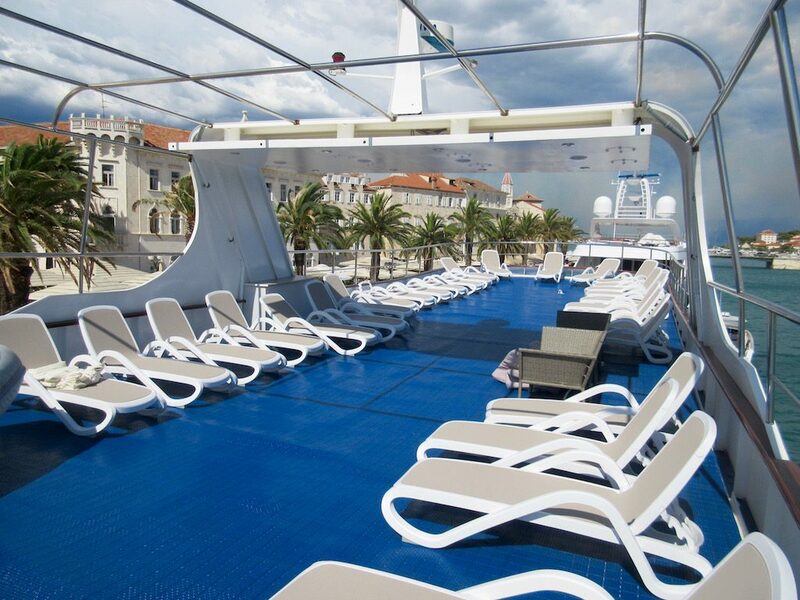 This morning we departed Rovinj about 9:00am via private coach for the town of Trogir on the Adriatic Sea. The bus ride, including a required 30-minute resting time for the coach driver, took six and a half hours. 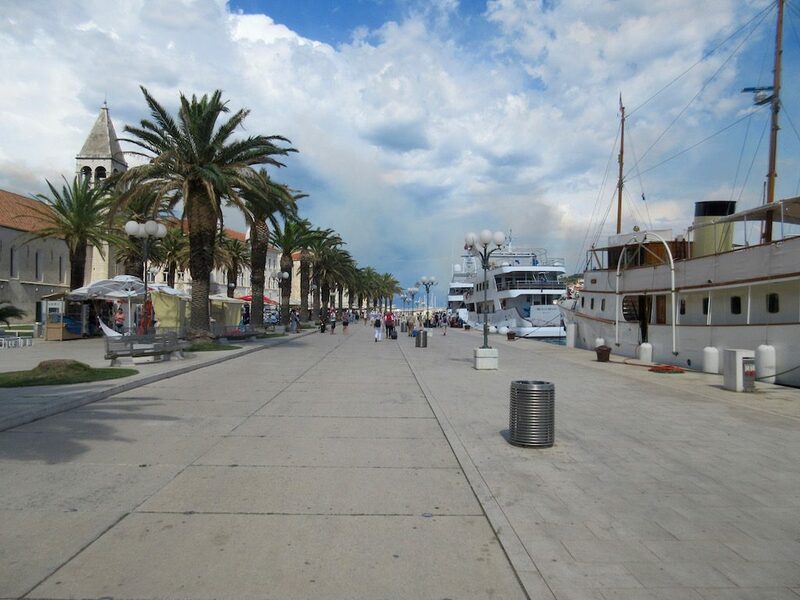 We arrived in Trogir about 3:30pm. The drive from Rovinj was very pleasant as we were mostly on recently built toll roads. These toll roads include stunning bridges over ravines and extraordinarily long tunnels carved through the mountains to make travel as quick as possible. The roads were built by foreign companies at no cost to the country in exchange for a certain number of years that the companies can collect the tolls on the roads. For the distance we traveled today the tolls might add up to a total of $100 US. Convenience and time has its price. The toll roads are extremely well maintained with rest stops, gas stations, hotels and restaurants along the way. We traveled on roads that were a bit further inland from the coast and it felt like we were in the mountains. The hillsides were covered with pine trees. As we veered off from the main toll road and made our way to the coast, the landscape began to change. It looked more Mediterranean with orchards of olive trees, acres of vineyards and other fruit trees. The hillsides were more brown than green and were covered with grasses rather than trees. 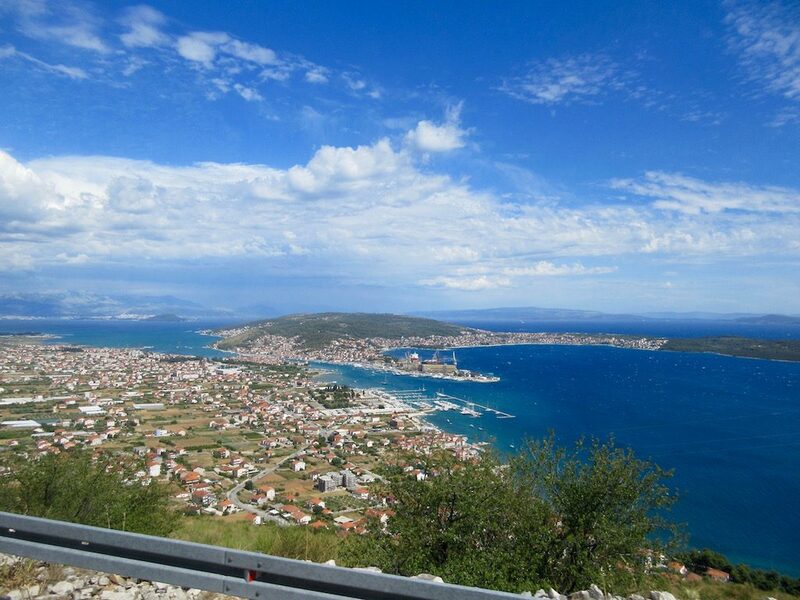 As we reached the summit of the hills just off the coast we had incredible views out over the Adriatic Sea, Trogir and the town of Split in the distance. Our home for the next week was the MS Robin Hood. 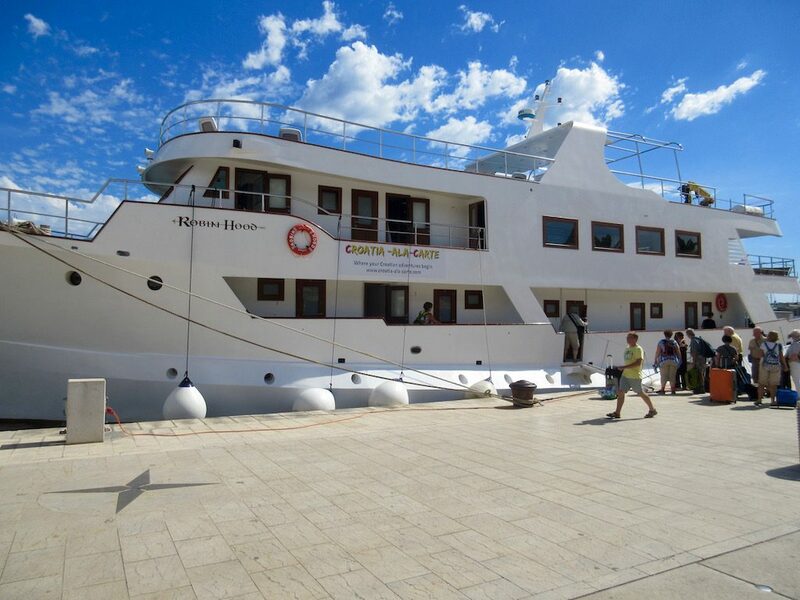 The Robin Hood is a small ship with a capacity of just 34 passengers. Our local guide and owner of the Robin Hood is a local named Debbie Knezovich. After boarding our vessel, the Robin Hood, we had a welcome drink and introductions to the captain and the crew. Shortly thereafter we enjoyed a late lunch or early dinner in the dining room. They served a light soup, roasted veal, French fries, a green salad, a mixed vegetable dish of carrots, peas, potatoes and such. Dessert was a chocolate cake with cherries. The weather was very windy in the afternoon and by the time we finished our late lunch it had begun to storm with lightning and thunder. 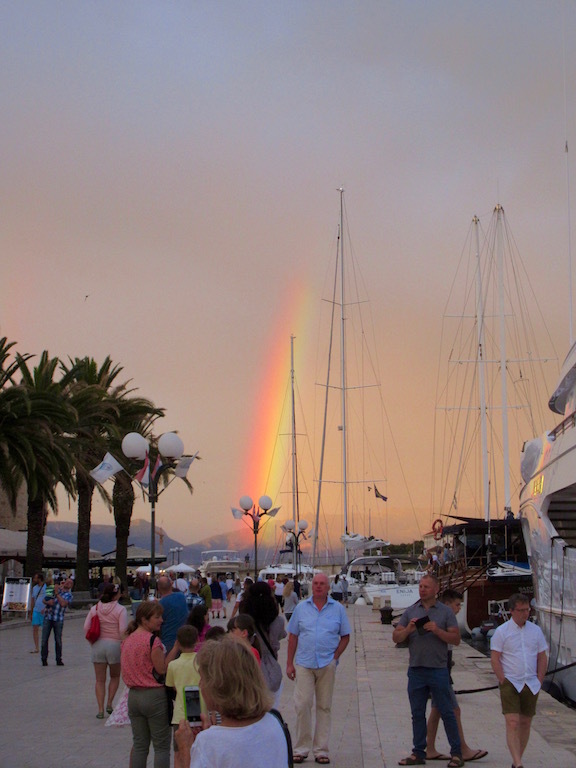 We had planned to sail to Split but instead the captain decided that it would be best to stay in the harbor over night and to set sail for Korcula at 7:00am the next morning. 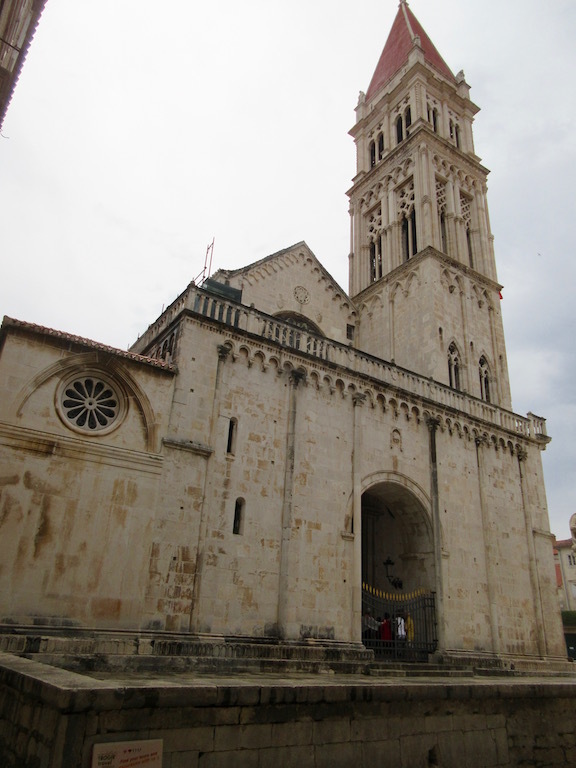 The rain subsided and we had time to look around the old town of Trogir before we met the group for a happy hour at an open bar just ashore from our vessel. The old town is quite small in size although rich in history and architecture. One of the local waiters pointed out to us that the city was once divided between the rich and the commoners. There is a line drawn in the main street with stone where the commoners were not welcome to cross. The homes on the rich side of the street were larger in scale and more elaborately decorated than those on the other side of the line. The narrow streets of the old town were more like alley ways than streets and they meandered through town more like a maze than in a grid pattern. Mostly the streets are lined with restaurants, small shops of souvenirs, local lavender products and gelato shops. The buildings are all constructed of huge stones hundreds of years old. Most of the windows have large wooden shutters on the exterior. Most of the buildings are left natural stone while others are stucco painted in mostly beige, yellows and orange tones. While we were having drinks at the bar there was an enormous piece of a rainbow that appeared in the boldest colors. There had been a fire in the hills earlier in the day and maybe the particulates in the air helped to make the rainbow colors more intense.